If you own a Mercedes you probably see it as an investment – as this valuable type of car can enhance your prestige and offer you many years of top notch driving experiences. Of course, when you own such a great car it is important to take good care of it so that it will last as long as possible. Keep the car parked in the shade or indoors in the summer time, as the rays of the run can fade the paint job. Make sure that you wash the car every few months so that you can keep slush and grime off the exterior, which will cause wear and tear over time. Waxing your car is also important for protecting the paint from moisture and corrosive materials such as bird droppings. When you run your hand over the surface of the car it should feel as smooth as glass. If it doesn’t then this is a sign that it needs to be cleaned and waxed. The brakes of your Mercedes should be inspected on a routine basis, so that you can spot any defects such as worn pads and excessive grooves. Also, the electrical system of your car should be checked out by a mechanic who is experienced and familiar with Mercedes electrical systems, rather than just someone who is a general mechanic of cars. 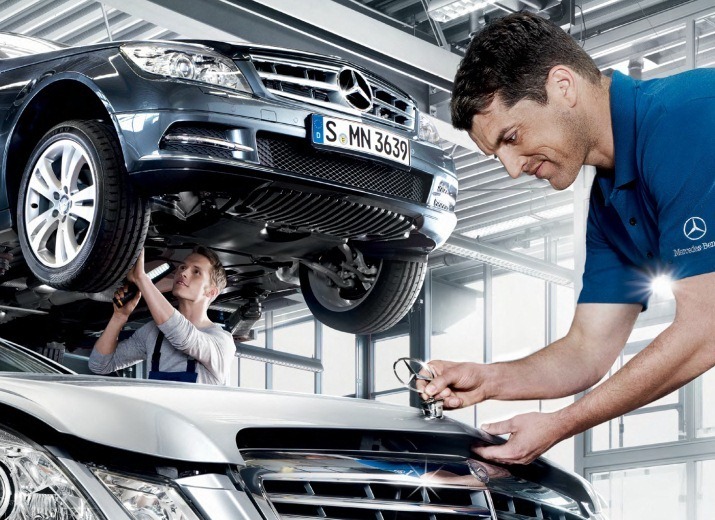 The transmission should be serviced after you own the vehicle for five years and the transmission fluid should be inspected every time service work is done on the Mercedes. It is also important to examine and replace the brake fluid level every 20,000 miles or so, as well as replacing the air filters at the 40,000 mile mark. Remember to use gasoline that has the right octane rating for the car. A Mercedes is a European model and not all types of gasoline will be the right match. When you use the gasoline that works best there will be fewer problems with the engine itself. It is also important to make sure that the tires have the proper amount of air pressure in them. When the air pressure is poor it will affect the alignment of the car and damage the brake system as well. Keep the interior as clean as possible so that stains and dirt will not negatively affect the resale value. There are hatchbag boot mats that you can use to protect the interior of your boot and you can even find Mercedes boot liners that are customized to a specific model of car. Vacuum the interior of your car often and use seat covers to protect the fabric or leather from damage and discoloration. You can also use a cleansing formula in order to keep your leather seats clean and protect them against damaging UV rays. If you notice any problems with the cars performance or hear any strange noises coming from inside, have it checked out as soon as possible rather than leaving it for a long time. The longer you leave a problem, the more damage it will cause. Check the coolant level on a regular basis. Make sure that the car is on a level surface and that the engine has cooled down. In a Mercedes you can turn the SmartKey to position 2 in the ignition lock and then check the coolant temperature display in the instrument cluster. If the coolant needs to be added you can slowly turn the cap half a turn counterclockwise and then add the coolant. Make sure that you run the air conditioner for at least 10 minutes every week, even in the winter when you don’t need it. This ensures that the air conditioner stays in good repair, because when it is not being used the hoses will shrink and dry and there will be loss of refrigerant. These are just a few important points to keep in mind when it comes to caring for your Mercedes. These vehicles are good quality and they can last for many years, but they need to be maintained and taken care of in order for them to be kept them in tip top shape.